Hi, my name is Kate (“Hi, Kate!”) and one of my New Year’s Resolutions is to stop losing my curry paste. Because I’ll be all set to make and photograph a delicious soup for y’all and I will not be able to find my curry paste. And it will not be the first time. And the REALLY sad thing is that I have more than one jar of it (I think…) and I can’t find any of them. But never fear, I still have one of my favorite side dishes! I love it because it comes together in about 2 minutes (well, 2 minutes if you’re using pre-peeled, pre-seeded, pre-cubed butternut squash, which I do out of convenience and also because I have a weird skin allergy to the skins, guts, and seeds of many gourds), it cooks up while you’re making the rest of dinner, and then clean-up is a breeze because you just toss the aluminum foil. I’ve never been crazy about squash with things like sugar and cinnamon–I like mine savory. So for this recipe, I use 24 ounces of butternut squash, a tablespoon of extra-virgin olive oil, kosher salt, ground cumin, dried parsley, onion powder, garlic powder, and a couple of pinches of cayenne, which is enough to give it a nice, mild, pleasant heat, but isn’t burny in any way. If you like the burn, feel free to add a little more. Preheat oven to 450 degrees and line a baking sheet with aluminum foil. Set aside. In a small bowl, whisk together the olive oil and the spices. A flavorful side dish to go with just about anything! In a small bowl, whisk together the olive oil and the spices. Place the squash on the prepared baking sheet and then drizzle with the olive oil mixture. Use your hands to toss to combine. 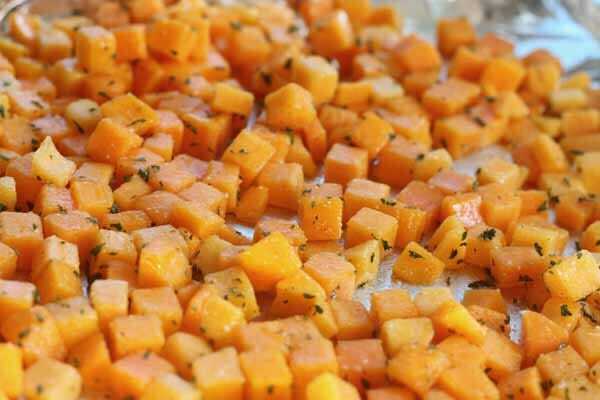 Spread the squash evenly on the baking sheet and bake until desired doneness is reached–if you like it tender and squash-y, 25-30 minutes should do it. If you prefer a deeper flavor and a some pieces with crispier, edges, bake for 35-40 minutes, tossing with a spatula about halfway through. Serve immediately. In a small bowl, whisk together the olive oil and the spices. 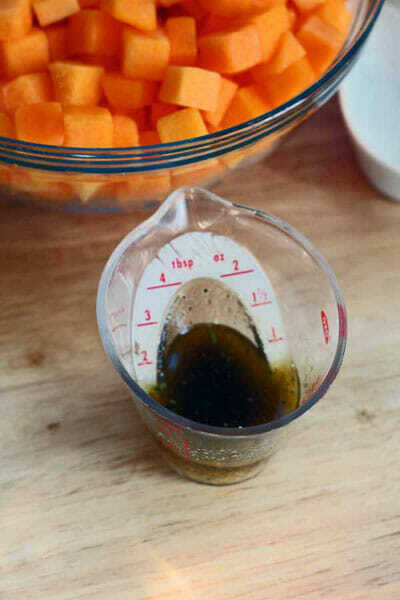 Place the squash on the prepared baking sheet and then drizzle with the olive oil mixture. Use your hands to toss to combine. Spread the squash evenly on the baking sheet and bake until desired doneness is reached–if you like it tender and squash-y, 25-30 minutes should do it. If you prefer a deeper flavor and a some pieces with crispier, edges, bake for 35-40 minutes, tossing with a spatula about halfway through. Serve immediately. Makes 6 servings. What is your favorite main dish to serve with the squash??? You know what I like about you girls? You make awesome things – lighter, but not so light it’s gross. You make real food for real people in real situations! – LOVE IT. BTW: it’s weight watchers “points plus” or you can say “points+” (they get a little persnickity about this since the ‘old’ program was just points – and yes I’m a WW lifer though I have not reached lifetime – ha!). I love all your recipes and have made many of them. The fact that you are including the points+ is fabulous. Thanks for all you do! Your curry paste is hiding out with your Christmas candy and my driver’s license. I wish they’d all quit teasing us and show up again. Looks good! And you can’t beat the ease. You must have been reading my mind! I was trying to figure out what to do with this squash hiding in my pantry! thank you!! Ohhh I love it. I love how the squash is cut instead of smooshed! Kate~ I have a weird allergy to the skin of butternut squash too! Does it seem to such every bit of moisture from your hands and make the crack? Strangely I can still eat them! Thanks for the great recipe! Sounds great! I think I will add squash to my grocery list, I have everything else. I love butternut squash! This sounds delish! I’m with ya on the allergy thing! No one ever knows what I’m talking about when I tell them that carving pumpkins makes my hands burn. This looks delish! Aren’t those 4 tablespoon Oxo measuring cups the handiest things ever? Love them. This looks super yummy. I love it when you include WW points! 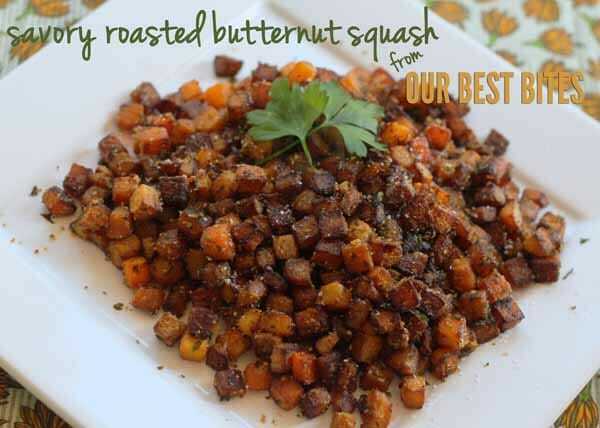 Thanks for the great recipe, I’m hooked on butternut squash. Please don’t get me wrong when I say this, as I am a huge fan of the blog and you girls, but are you crazy? You are ingesting a food that you have a known skin allergy to? I bet your tummy gets upset when eating this. As a health pro in the allergy biz, please hear me when I tell you that continued exposure to the item will make your allergy worse over time, and quite possibly dangerous. If your skin doesn’t like it, certainly do not ingest it! Looks so yummy! I’m also not big on sweet butternut squash. Your blend of spices sounds delicious! Ok, If I didn’t super love your site before (I did), I love it even more now! I have made dozens of your recipes, and I’ve never been disappointed. And your addition of the WW Points+ on this is great! 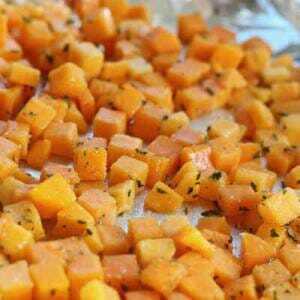 I tried this exact recipe last night using yams instead of squash and it was so delicious! Thanks for doing healthy recipes! This exposes my complete ignorance of anything Squash-related, but are these kind of like cubed french-fry-substitute-things? Maybe tater tots? I’ve never had squash before really and I’d like to try this, but I’m afraid I’ll make a big batch and not like it. I had never had squash either, but I made this last night because it sounded so delicious. It tastes just like their baked sweet potato fries. I love the savory squash too. I thought squash was gross until I had it cooked without sugar and LOVE it. Can you really buy pre-peeled, pre-seeded, pre-cubed butternut squash? I have never seen it, but the work this would take to prepare is definitely a draw back for me. If it really exists, where did you find it? Thanks for your awesome recipes! Okay, missed the message about where you find in your grocery store. I’ve never seen it this way, but will make a quest to search it out in my area. Thanks again! Okay, just saw where you posted about finding it in your grocery store. I guess I skimmed too quickly the first time. It is my new quest to find this in my town. Thanks again! I love butternut squash in a completely unhealthy way. I usually just eat it plain with butter and salt, though. Maybe it’s time I dress it up! Great idea! this was fabulous! My new favorite way to make squash!! Thank you for sharing! I made this last night. LOVED the flavors, will be making this OFTEN. I find chopping a butternut squash therapeutic for some reason! Absolutely delish — even my ‘no cooked veggies’ son liked it. I added carrots the second time I made the recipe. I think it would work well with any root veggie. Made this tonight and really enjoyed it! Although I wish I had sprayed the foil before baking; there wasn’t enough oil to keep the squash from sticking. I know exactly what you mean. I always think that I have a jar of red curry paste, but then I can never find it. So I go and buy another one, and then the vicious cycle starts again. There are actually several things in my kitchen I think I have but I can never find. Maybe one day they will turn up! 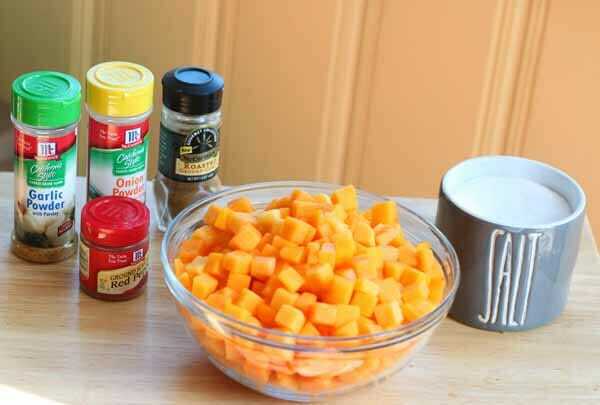 Butternut squash recipe sounds great! Made this yesterday and it was delicious. Two of us ate nearly all of it for dinner and wished there was more. Next time I will double it. Thanks for a savory squash recipe. I’m not a fan of sweet vegetable recipes in general, and especially not squash. I made this for dinner tonight. I kind of forgot about mine and cooked it too long, but it was still yummy. My 5 year old (who hates squash) loved this. It reminded me of roasted red potatoes. Using the bagged squash saves sooo much time. And the size of chunks is perfect for steaming and giving to my self-feeding baby. Thanks for the tip! SOOOOO delicious! My whole family gobbled it up. I tried this recipe and WOW -it is sooooo good! I am on a very restricted diet and the only change I made was that I skipped the oil and tossed my squash with a little water so that the spices would stick to the squash. I mixed the spices in a pinch bowl then sprinkled over the squash and tossed -then on the the pan per your instructions! YUMMY! Thank you so much for the easy and DELICIOUS recipe! (p.s. Your mint chocolate chip brownie cake recipe is a favorite with my whole family!) THANK YOU! I just made this. I used cubed butternut squash from the freezer section. I used the spices I had on hand, and I added a bit of balsamic and some Worcestershire sauce. Yum! I absolutely loved this recipe and even peeled my own butternut squash to make it (not such an easy task). I had been planning on a soup, but wasn’t too excited. So glad I found this. Loved the little browned bits. I have been eyeing this recipe for a while and just tried it today with some butternut squash that’s been hiding out in my fridge for several days. It was soooo good. I made half a recipe and ate it all myself for lunch. Thanks for such a great, easy, healthy and yummy squash recipe that does not involve sugar or butter! Wow! Who knew squash could be so good? This is the first time I have roasted squash and I loved it! I will definitely be making this over and over again. This was so good. Was not going to put the cayenne pepper but glad I did. Will definitely do this again. This is So. So. Good. I’m cooking it today to the just-before-crisp-edges stage and putting it in soup. I have not made your recipe for this (yet! ), but I have been making something similar for years. I put rosemary and thyme with mine and then in the last few minutes of cooking I add blue cheese crumbles and chopped pecans. It is AMAZING!! My husband and I love this recipe! I will even make it as a main dish, in which case I cube some chicken or turkey sausage and toss it in with the squash. I also add 1-2 (depending on how much squash I end up with) cubed granny smith apples to the recipe. Super delicious!